If you’re considering purchasing a subcompact sedan in the near future, it’s time to get to know the Nissan Versa Sedan. The staff of Sheehy Nissan of Glen Burnie is proud to introduce the current year’s model of this popular vehicle brand, and we believe that you’ll like what you see when you take one out on the road for the first time. 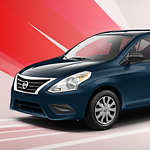 The Versa Sedan is designed to navigate and handle like a higher-priced luxury vehicle. Drivers and passengers alike are sure to appreciate the smooth ride provided by the top-quality suspension and power steering systems. Under the hood, the Versa Sedan is powered by an efficient engine that is able to achieve an estimated gas mileage rating of almost 40 miles per gallon on the highway. Prospective buyers also have the choice of a five-speed manual or automatic transmission.